The soon-to-be "Late Show" host Stephen Colbert has to keep viewers laughing. And there's one specific subset of viewers who are particularly important: the advertisers who commit to buy air time on his show. Colbert's advertiser charm offensive is already underway, as demonstrated at CBS's annual upfront presentation for advertisers at Carnegie Hall in New York. Colbert took the stage on Wednesday afternoon and joked about wanting to work with his new "adver-buddies." "You advertisers want young eyeballs," he quipped, "and not just the ones Rupert Murdoch buys on the black market." Colbert seemed to win over the crowd immediately. 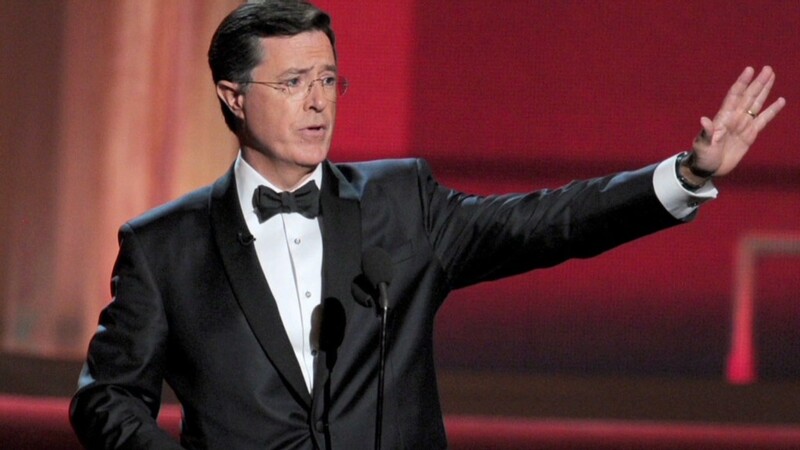 "If Stephen Colbert's upfront shtick was any indication, he's going to rock late night. Not that we had any doubts," Variety's executive editor for TV Debra Birnbaum tweeted. He had some fun at CBS's expense too, acting surprised that there's now a "CSI: Cyber" spinoff. Alluding to CBS's many crime dramas, he said, "Most of my show will be me solving murders by zooming in on pubic hairs." Colbert's appearance came one week to the day before David Letterman will sign off of "The Late Show." Colbert will take over on Sept. 8. Letterman was not at the upfront, but his name came up repeatedly with CBS Corporation CEO Les Moonves saluting the comedian's "legendary career." "As one era comes to an end, another begins," Moonves said, referring to Colbert's September start date. Colbert also said he'd strive to honor Letterman's legacy -- by occasionally making the network angry at his antics. Ahead of the upfront ad sales season, Colbert has already met with a number of key advertisers, according to CBS ad sales chief Jo Ann Ross. "He was full of energy talking about his new show," she said at a morning press conference. Ross said Colbert would be "advertiser friendly, but in his own voice." The comedian had lots of fun with sponsors during his time on Comedy Central's "The Colbert Report," and at the upfront he said he's open to more of the same on "The Late Show." Colbert's late-night partner will be James Corden, who recently started hosting "The Late Late Show." Corden also appeared at Wednesday's upfront, and he said he's looking forward to having Colbert as his lead-in. "I really feel like we have a great opportunity at doing something which is new and fresh and vibrant and wonderful," he said.